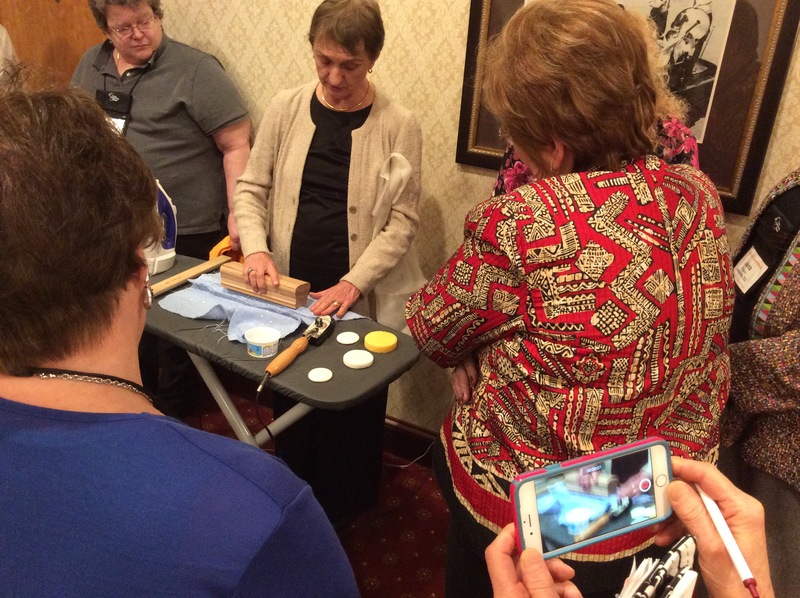 Recently, The Association of Sewing and Design Professionals held their 2015 Conference, The Fine Art of Sewing and Design, in Minneapolis. Although I’m not a professional sewist, I jumped at the chance to take a sewing class, especially as the conference was so convenient. This time I had the time, an online class was not available, and I freed up the money. Funny how that can work out. 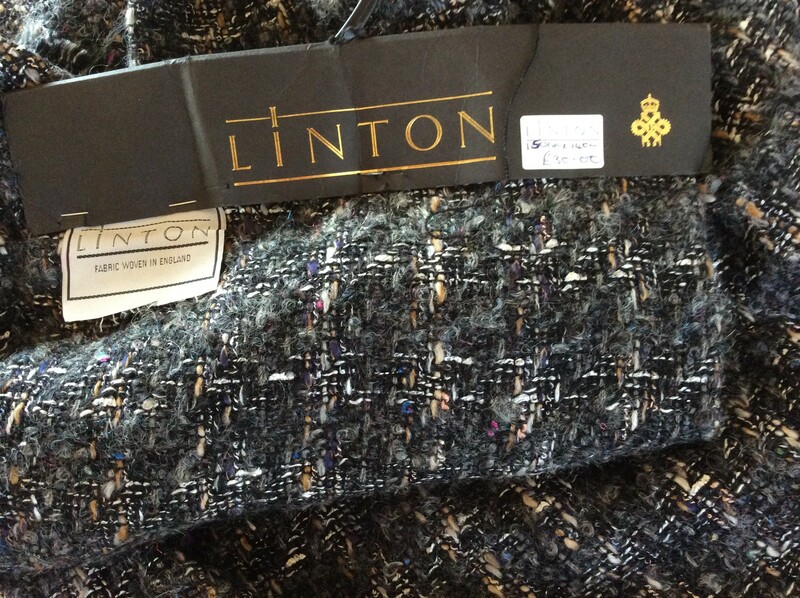 Also, a 1997 vintage Linton Tweed is desperate to become a wearable jacket on my back. 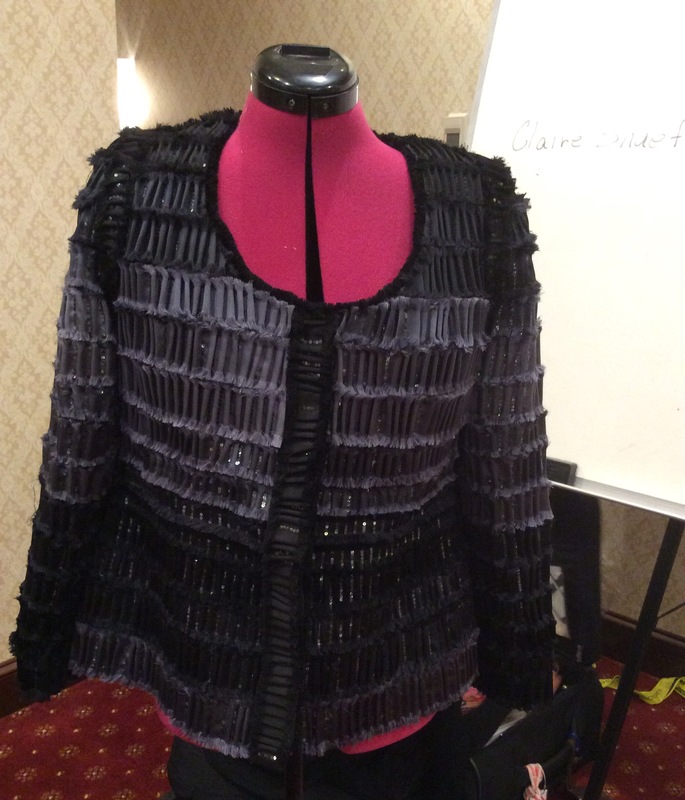 Therefore, I chose That Chanel Jacket by Claire Shaeffer, a two day, hands-on class. I have picked up bits and pieces of Claire’s Chanel classes when conducting Stitches, Fiber Fashion Fun group tours (out of business since 2001 and way before Facebook and even Internet; Google turns up nada. ), but never enough to feel competent. Yes, I have her book(s) and DVDs, but it’s just not the same as that in-person class where you can ask questions, SEE a technique that just can’t be photographed, and learn from classmates. 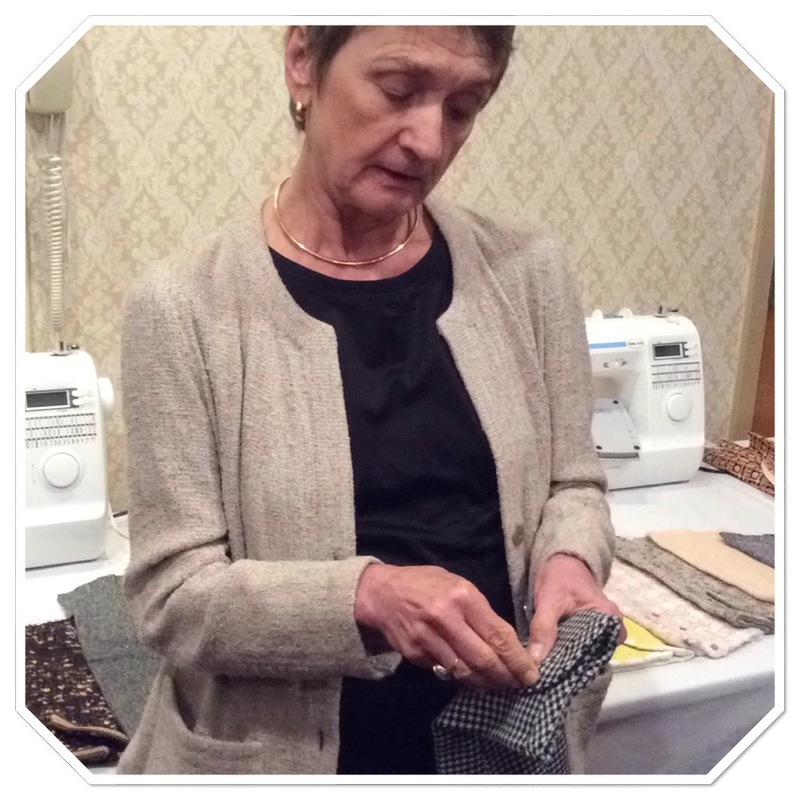 Claire taught one of her first Chanel classes for Stitches in 1997 and then conducted a London tour that took us to Carlisle and Linton Tweeds. Here we purchased our authentic Chanel style fabric. Today you can shop online but there is nothing like being in the actual shop just down the street from the Cathedral. This is my 1997 vintage Linton Tweed. Hope there is enough yardage. Label says 150 cm x 140 cm so should be able to scrape by. Paid £30; that’s about $45 today. Eighteen years ago that would have been $19.60. Because of the class, I now have samples, notes and photos to guide me thru my Chanel Jacket. Knew of the above but actually seeing and using, seals them in my sewing repertoire. Am stuck in a rut and use same old, same old; probably because it’s available. Like the Self-Threading Needle. Should have these but it’s more fun to tear the sewing room apart looking for the needle threader. Here’s what I learned in hands-on class I never would have picked up elsewhere as it was a bit of a ‘throw-away’ comment. Use it to pull a short thread end to the inside when thread is too short to insert in a regular needle eye. 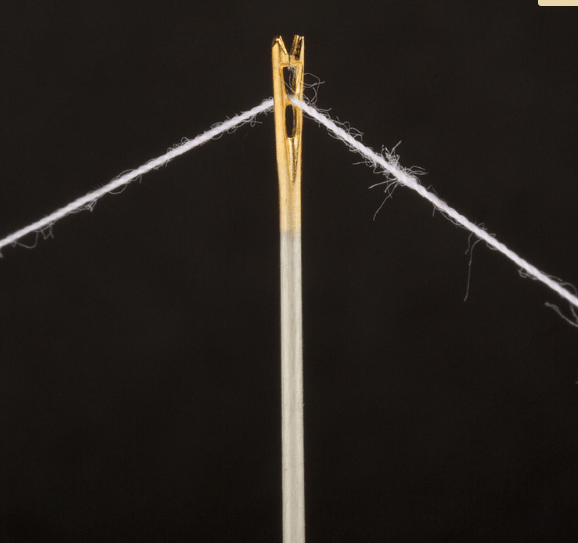 See the notch in top of needle (above); lay thread over notch and pull down on one end (while holding other end) into needle eye. Slick! Pins: lots of different kinds and we made a cheat sheet. 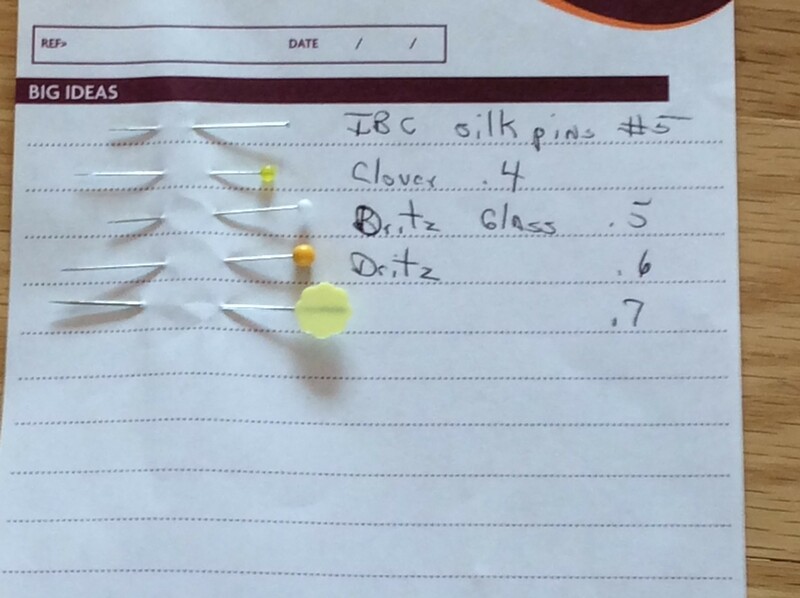 Even after the review, I prefer long, fine, glass head pins; glass doesn’t melt under the iron. Again, am in a rut and use the slip stitch for anything with a fold; if it doesn’t have a fold, I figure out a way to make one. You best know the catch-stitch, the basting stitch and the diagonal stitch. Oh, yes, the ladder, the fell, the tailoring stitch. A refresher was definitely in order. 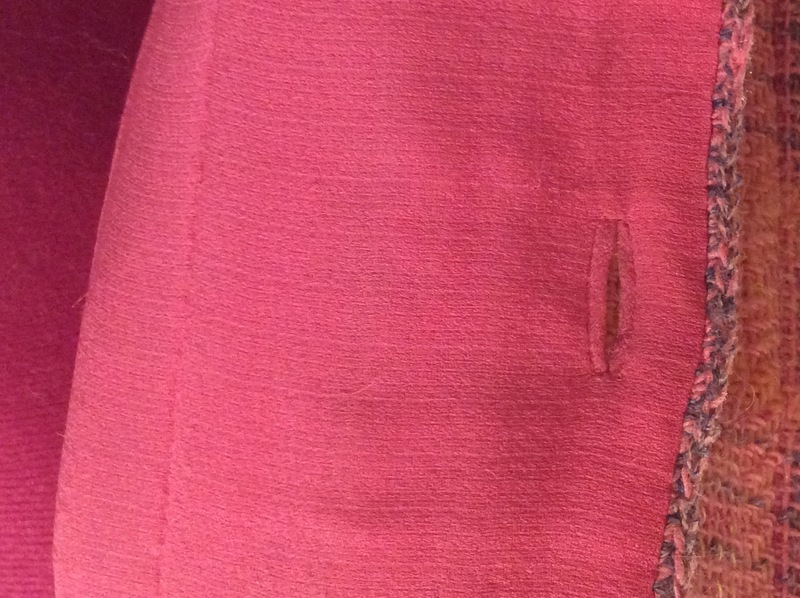 A pressing tip I had heard before but forgotten–use a sliver of soap to ‘glue’ down seam allowances. Thanx for the reminder. We all cleaned out the soaps from our hotel rooms! 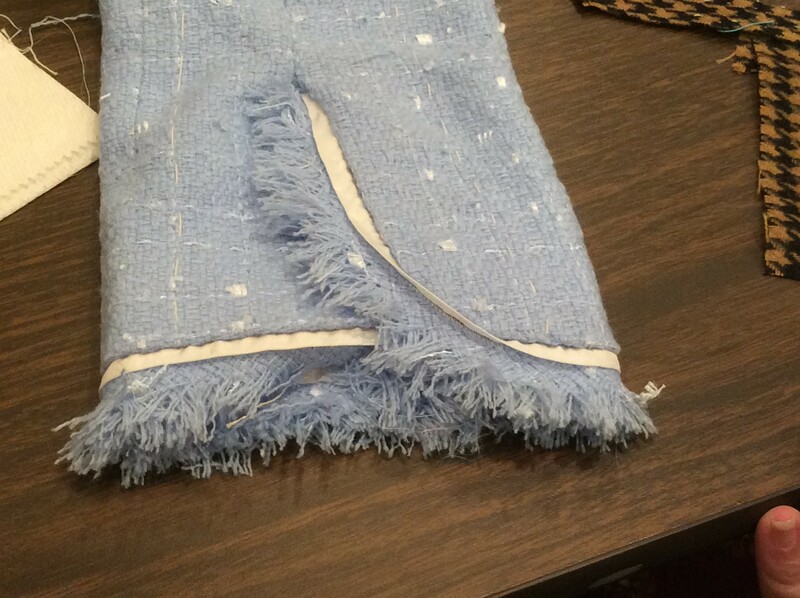 This is a classmate’s sleeve hem sample with fringe and piping. She didn’t have enough fabric for bias so cut it on the crosswise and now has a physical reminder of a lovely finish. All of my class samples and notes are packed away in a plastic school supply case. I stock up on them when school supplies go on sale in August. For inspiration, here are some photos from Claire’s collection. These are the Real Deal and only at hands-on classes will you have the opportunity to get up close and personal. The jacket above is made from strips of ombre satin, hence the ‘shading’ from light to dark. 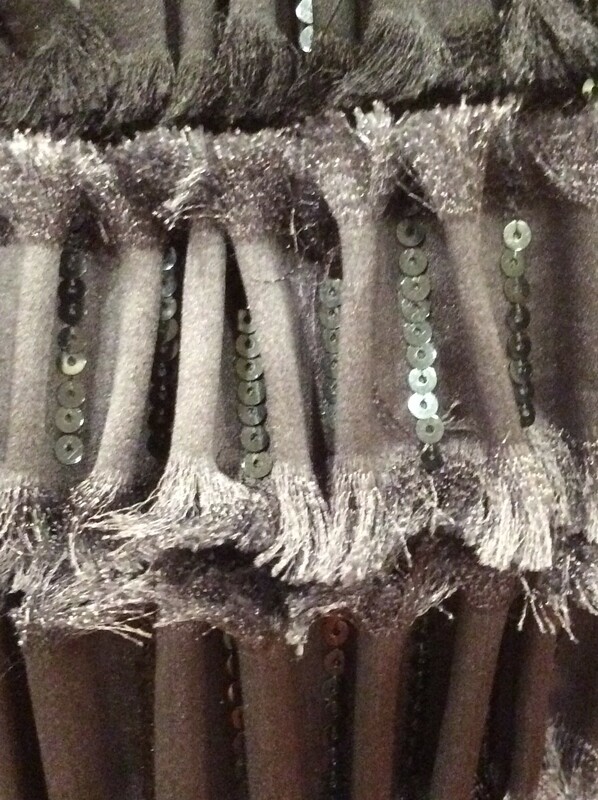 The closeup is overexposed to show the fringed and cartridge pleated strips held in place with teeny, tiny sequins. This entry was posted in FIBER FASHION FUN and tagged Carlisle, Chanel, Claire Shaeffer, cotton basting thread, dauber, LintonTweeds, self-threading needle, That Chanel Jacket. Bookmark the permalink. 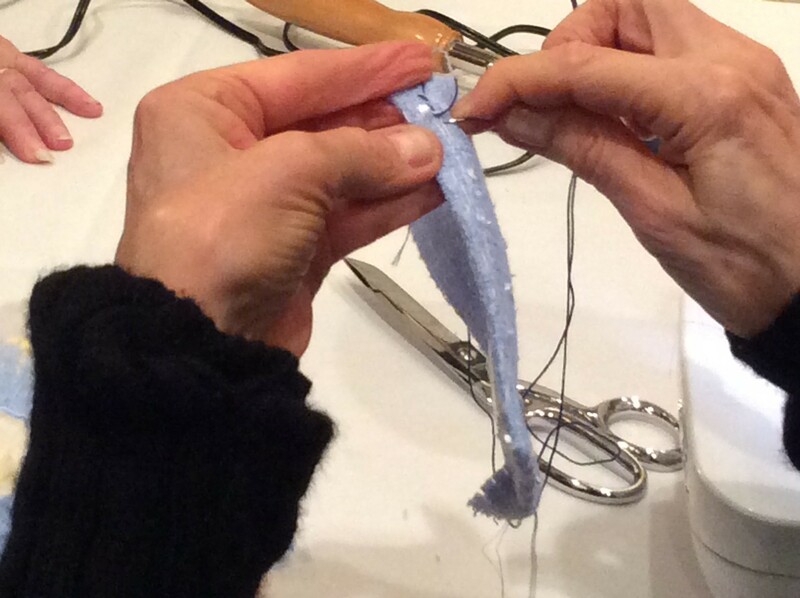 4 Responses to Is a Hands-on Sewing Class Worth It? You are so lucky! I love the fabric for your jacket. 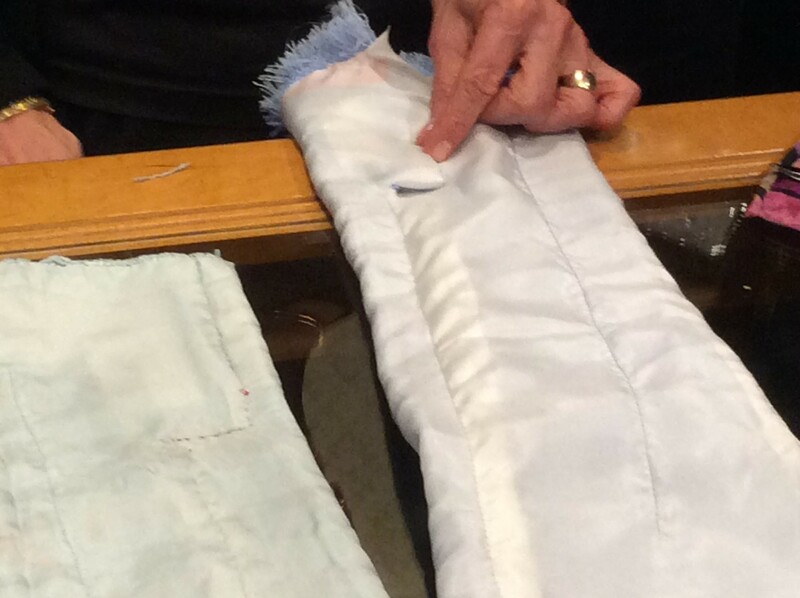 Thank you for such an interesting post Carol – I have made this jacket with CS’s instruction and read her book line by line. But this adds a lot of “colour”. And I absolutely love your Linton. So subtle and nice. Thanx. Feel confident with the techniques but now comes the fitting. 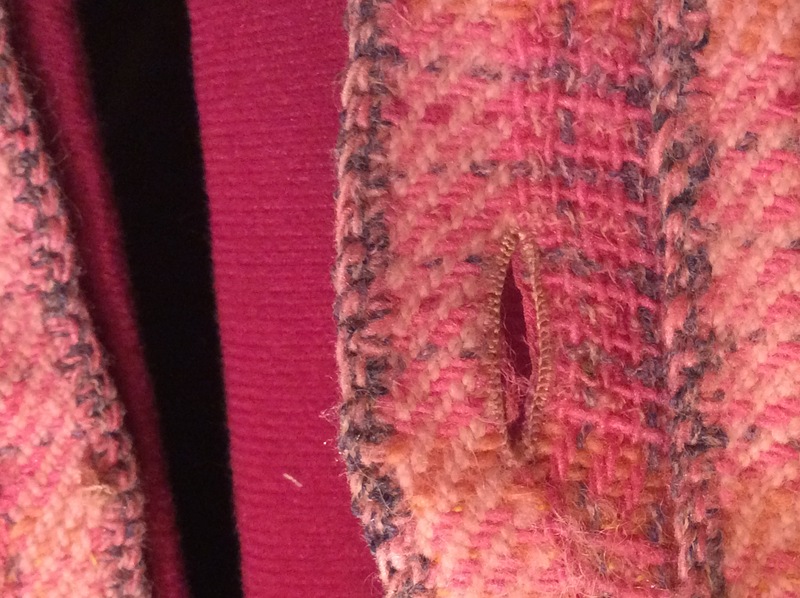 Concerned about getting the ‘high armhole’ just right.